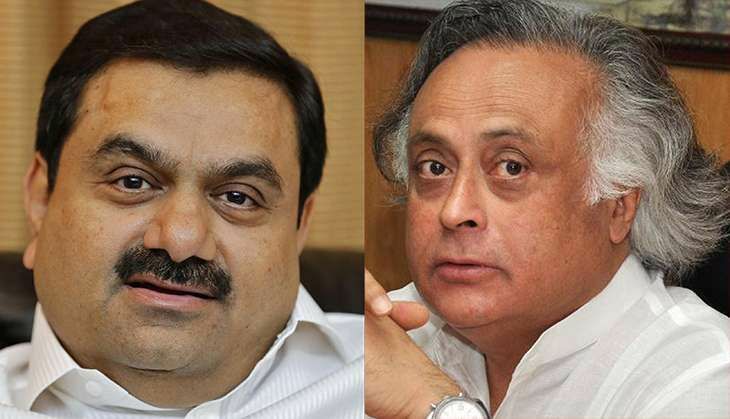 A war of words has ensued after industrialist Gautam Adani accused former environment minister Jairam Ramesh of making him and his company a political target. Ramesh has denied the allegations - which pertain to his term as environment minister during the UPA regime. He alleged that Adani has been a direct beneficiary of Modi's largess. The bone of contention between the two was a decision regarding a coal mine in Chhattisgarh. In an interview published in a leading economic daily today, Shri Gautam Adani has claimed that I am being inconsistent and that I am making him and his company a political target. Shri Adani has quoted from a large number of papers in his possession to show that I had given clearance for the coal mine concerned in Chhattisgarh. These papers, incidentally, were put in the public domain by me after taking the decision in July 2011 to give the go-ahead to the state government of Rajasthan in whose name the particular coal mine had been allocated and which had applied for approval. I stand by that decision fully. What Shri Adani has conveniently forgotten is that the issue now is not that he is the mine operator selected by the Rajasthan government. Shri Adani has deliberately side-stepped the real issue: that the Chhattisgarh government has cancelled the rights that have to be settled under the Scheduled Tribes and Other Traditional Forest Dwellers (Recognition of Forest Rights) Act, 2006 before the mine can be developed. I had provided detailed evidence to show how the present Secretary in the Union Ministry of Tribal Affairs was supporting the Chhattisgarh government's brazenly unilateral move to benefit Shri Adani by circumventing a rule I had myself laid out as Minister of Environment and Forests in August 2009-that projects in forest areas should not and will not get clearance unless all rights-individual and community-are settled under the law passed by Parliament with great exuberance and expectation in December 2006. Shri Adani should have had the intellectual honesty to acknowledge the issue in dispute. That he is the beneficiary of Shri Narendra Modi's largesse both as CM of Gujarat and PM of India is beyond any doubt. Jairam Ramesh says forest land area has been given to Adani for mining in Chhattisgarh. Let me put the record straight. First, this mine is not ours. It is owned by the Rajasthan government. After the bidding process, the Adani Group was chosen as a mine contractor. The mine is owned by the Rajasthan government. You would be surprised to know that this happened when the Congress government was there in Rajasthan. And who gave permission for this mine? It was no one but Jairam Ramesh...This was the last permission Jairam Ramesh signed before he left the environment ministry. I will give you all the copies of permission that he himself gave us. So why is he raising this issue, I cannot understand.